Even at The Restory Atelier, where we see many exquisite accessories come and go, occasionally you come across a piece that is so special and beautifully constructed that it deserves to take centre stage. Many of our clients have a penchant for vintage and handcrafted pieces meant to last a lifetime, which is especially the case for handheld accessories such as: men’s briefcases, suitcases and holdalls. 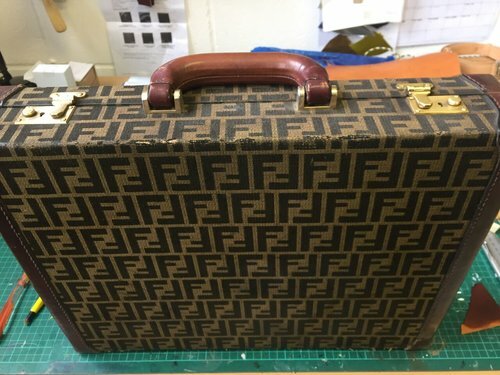 One of those special clients recently sent us his favourite set of matching Fendi briefcase and suitcase for repair. Fendi has been reviving its traditional logo fabric over the past seasons and this was the perfect opportunity to take a closer look at the remake of an iconic piece. The classic monogrammed logo fabric and sturdy construction of the pieces clearly indicate they are built to last, but there comes that inevitable time when wear and tear causes the material on the corners and edges of the bags to become sensitive and start fraying. In this Case Study we’ll give you a closer look and take you through the restoration process of the Fendi briefcase. In this case, the leather and fabric had started to look a bit tired and in need of some special cleaning and reconditioning, which is an essential step in reviving and protecting any leather piece. Firstly, we started by applying special cleaning techniques that will not only clean but also help us assess the actual damage on the item. We also take extra care to give a mould treatment to all vintage pieces we work on as they have been kept in storage for a long period at some point in time. They tend to carry a strong smell and after the mould removal process we like to air them out over a few days to make sure any unpleasant smells don’t linger. Due to general wear and tear the hardware can look tarnished over time and in this particular case the varnish atop the hardware had come off. This required the removal of the old varnish before the hardware was brushed to give it a soft polish and achieve the look of its original finish. This is however only possible on non-coated solid brass hardware. After taking a closer look at the leather parts, it was clear that there was noticeable discolouration at the edges of the briefcase. Therefore we decided to treat the leather with a combination of dyes and waxes to restore its colour and finish. As the Fendi logo fabric had worn off around the edges, our Head of Atelier suggested adding leather corners on all sides to prevent further damage to the briefcase. Knowing the alteration would slightly change the look of the briefcase; the remake was executed in such a way it would blend in with the original design. After measuring and marking the affected area, strips of thin vegetable tanned leather were carefully cut and dyed to match the fabric of the briefcase perfectly. Each leather strip was re-shaped and colour matched to fit the case and accommodate and complement the existing fabric and leather. As a final result this vintage gem of a briefcase was brought back to life, restored anew and ready to accompany a very happy client for many years to come. The Atelier team at The Restory is specialised in providing creative solutions that are tailor made to fit the requirements of the client. Curious about our bespoke services? Email your query to service@the-restory.com and our Client Services team will be in touch shortly.